1979: Cuban Schools in the Seventies. This text has been taken from the paper "20 Years of Construction in Cuba. Schools and Social Buildings", read in July 1979 at the Museum of Ethnology and Folklore, Budapest, Hungary. For a Hungarian translation of the original text use this link. "The combination of productive labor with education in an early age -claimed Karl Marx- is one of the most powerful means for transforming modern society". This idea has been, from the outset, the guiding principle of educational policy of the socialist regime in Cuba, and has manifested itself in different ways. A School City in Sierra Maestra. Already in 1959, the idea of creating in the main theater of the guerrilla uprising, the Sierra Mestra, a School City arised. It was to accommodate 20,000 children of peasant origin, those who living in the mountainous areas had hitherto been deprived of education. This "Camilo Cienfuegos" School City, built on a place deep in the mountains known as "Las Mercedes", opposes to the isolation of traditional rural housing, an urban complex composed of school and dwelling units. It features a cultural / recreational / administrative area, a public services area and an industrial area that includes factories and model farms for the student to work in, everything occupying an area of around 6,700 hectares. It took some time before that first experience surrendered its fruits, becoming widely applied. Meanwhile, the 1961 literacy campaign took place. After that, thousands of teenagers enrolled as volunteer teachers bringing primary education to the most remote countryside and mountains. Private schools were nationalized. An adult education system was created. A vast scholarship plan was implemented and mid-level education was expanded considerably through the establishment of new basic secondary schools throughout the country. The School in the Countryside. During this stage the "school to the countryside" system was officially established as a way to link students from the seventh grade on to manual work in the fields. This system consists in moving students and teachers for 45 days to camps provided for that purpose in agricultural production areas, making possible the participation of the students in various productive tasks beside the place's agricultural workers and technicians. In the 1969-70 school year the first School Secondary School in the Country began operating. The development of this new type of school represented a qualitative leap not only from the educational point of view: it was so also at the level of school architecture, and had repercussions even on other building programs. Escuela secundaria Básica en el Campo. It was the prototype for a giant school buildings plan that would create the conditions for the complete integration of work and study throughout the country. These schools would be located on areas suitable for crops such as citrus, coffee, tobacco, tubers, grains and vegetables, where productive activities were considered compatible with the age and skills of the student. Just over 500 hectares of farmland would be allocated To each school, in which students would work during sessions of three hours a day. This work session would alternate with five hours of teaching and various sports and cultural activities. Each school's enrollment would be of 600 students, all boarders that generally came from neighboring regions. Until then, no constructive program in the country had reached such massive levels. The demand for mid-level schools was the result of the explosive increase in enrollment since 1970 as a result of the extension of primary education to all school-age children during the first decade of socialism as well as because the demographic explosion that took place during those years. During the 1971-1972 school year middle and secondary pupils had tripled the 1958-59 indices and a rate of 130 students at this level per 1,000 inhabitants was expected to be reached in 1980, representing a number fifteen times that of the 1958-1959 school year. Hence it became necessary to create the material conditions for a corresponding increase in the construction sector's capacity. School buildings so far had been built mostly using traditional procedures. 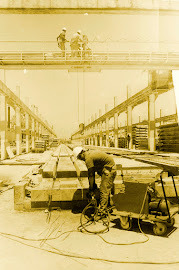 Some experiments were being made with systems offering partially prefabricated solutions, such as the old "Novoa System" (now renamed "Sandino" to put it in line with the new official ideology) which is essentially a bearing wall system based on columns and small tablets whose dimensions enable manual placement, roofed with a concrete plate cast in place over prefabricated joists. Other more frequently used system was based on porticoes where the structure and roof are prefabricated and the closure is made with bricks or blocks in the traditional way. Both systems have drawbacks as the low level of industrialization and the limitation in the number of floors, two at the most in the "Sandino" and one in the porticoes system. Secundaria Básica Urbana para 1200 alumnos, Arquitecto R. Togores. Dibujo de Rafael Fornés. 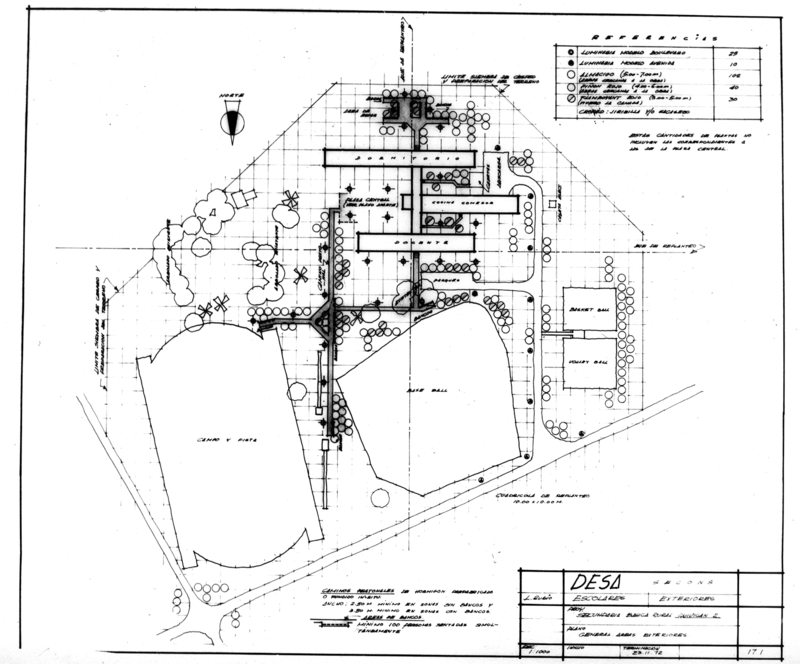 When the design of a standard basic secondary school in the countryside (ESBEC) building project was commissioned to the National School Construction Group, led by Architect Josefina Rebellón, the solution had to begin from the design of a highly industrialized construction technology that would allow to achieve, under the conditions of equipment and manpower available to the country, the desired growth rate in the construction plans. The answer was the "Giron" system, initially conceived under the direction of engineer Anibal Rodriguez Hoffmann and later on developed by the also engineer Esmildo Marin, based on a prestressed ribbed slab whose large-scale production had already began. Considering the functional requirements of school buildings, girder lengths of 7.50 m and 6.00 m with bay widths of 6.00 m were adopted, considering in both cases the dimensions between axes. The system includes girders with 2.80 m cantilevers. Except for the floor and roof slabs, which are prestressed concrete, all other elements are reinforced concrete. This system allows reaching a height of four floors, and in exceptional cases five. As the typical column only had the height of one floor and the horizontal forces were taken by the structural walls that acted as diaphragm walls, it was possible to solve with the same elements one story programs such as daycare centers and dining halls, two story programs such as semi-boarding elementary schools, and those with three and four stories as most midlevel teaching facilities. Horizontally its growth was unlimited in both directions. Perpendicular to the frames formed by beams and columns, growth was achieved by simply adding new frames each 6.00 m. In the other direction they could be extended by adding beams with 6.00 m 7.50 m lengths, terminated with or without cantilevers. All the transportation of prefabricated parts was done by road using for this the normal transportation equipment except for the wall panels, whose transportation was performed in specially designed panel carriers. The size and weight of the components was studied so there were no difficulties with the vehicle capacity then available. The assembly could be made with different equipment, preference being given for buildings up to two floors to truck cranes on wheels and for three or more stories to electric powered cranes on rails. In 1970 two secondary schools were delivered with a total capacity of 1,000 students. In 1971 eight school facilities were delivered with a total capacity for 4,400 students. In 1972 fortysix school facilities were put into service with a total capacity for 23,800 students. The plan for 1973 provided for the completion of 99 school facilities with a total capacity of 60,860 students. At the end of the 1971-75 five year period an annual output of prefabricated school modules of 150 Countryside Secondary School buildings prefabricated modules or their equivalent in other types of schools was reached, with a total area of 1,100,000 m2 which enabled an annual increase of 90,000 students in the capacity of secondary and high school level boarding schools. But the increase of 700,000 students at that level for the five year period also required the construction of 100 modules each year using conventional construction, including wooden schools destined mainly to the mountain areas. ESBEC: The Junior High School in the Countryside. The project that gave rise to this impetuous growth, the Junior High School in the Countryside, is very simple as a design. It is composed by three parallel buildings: the classroom building, the kitchen and the dormitories, connected by a transversal gallery. The total floor area is just over 7,000 m2 and is complemented by a meeting square and sports fields. 344 schools of its kind were in operation for the academic year 1977-78, with a capacity for over 200,000 students. Pedagogical Schools for Teacher Training. Polytechnic Schools and Institutes for various specialties. Special Schools for the Mentally Retarded, Blind and Deaf. Party, Youth and Mass Organization Cadres Schools. Up to 1978, 13 pedagogical schools -of a total of 18 to be built according to plan- had been finished, with capacities between 2,000 and 4,500 boarders each. These centers are associated with experimental primary schools where students do their teaching practices. The program is solved with standard buildings that are adapted to each site. As an example we have the Teacher Training School in the city of Camagüey, which is noted for its integration into the urban fabric of a new micro-district. The educational, lodging and administrative buildings, are connected to form a single spatial unit of longitudinal development. Bound to the residential area by a pedestrian bridge which saves a heavy traffic street, it is linked by it to the associated primary school. The aim of vocational schools was the orientation of the best students towards university careers related to technology and science which were considered most needed for the country's development. 15 schools of this kind were scheduled, of which 7 were operating or under construction in 1979. The capacities of such schools are 2,500 or 5,000 students according to the population of the province in which it is located. This type of school includes the junior and senior high school levels, with students from 11 through 18 years. Given its size, features and services they constitute true urban complexes. They include, in addition to classrooms and dormitories, a cinema, a library, laboratories and technical scientific interest circles, a science museum, scientific and technical exhibition halls, a computer center, a gym, dance and multipurpose halls, a theater, music and arts halls and extensive sports fields with an olympic pool, track and field facilities, etc. Schools also have land for agricultural work and experimentation. Alongside them are Industrial zones operated by the students. All these facilities are linked by galleries, squares and courtyards of different sizes. The Lenin School in Havana was the pioneer of these schools with about 5,000 boarding students. This school was officially opened in early 1974 by the First Secretary of the CPSU, Leonid I. Brezhnev. The Vocational School of Holguin is similar to the Lenin in size and design criteria. In Camagüey the Maximo Gomez Vocational School, with capacity for 2,500 students, is part of the school facilities ring that surrounds the city. The central axis of the composition is made up of the facilities related to scientific and technical training. Of that same capacity Is the Federico Engels Vocational, of more recent completion and which has been been enriched by the experience gained in the preceding projects. The Vocational Schools have served as a testing ground for the integration of the work of artists, with the series of murals in the the Lenin School and the commemorative sculptures in Camagüey and Pinar del Río. The "Camilo Cienfuegos" Military Vocational Schools are middle schools for boarders, located near major cities. In them military training is imparted, along with junior secondary education so they serve as a quarry for future officers in the armed forces. The capabilities of these schools vary between 500 and 1,000 students. The Physical Education Teachers Schools (EPEF) and the Sports Initiation Schools (EIDE) were developed for the promotion of sports. 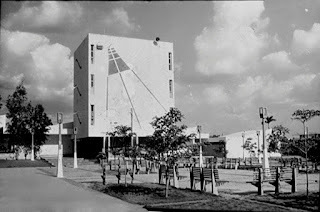 Five EPEF had been built or were under construction in 1979, in the major urban centers such as Santiago de Cuba, Holguin, Camaguey, Pinar del Rio and Santa Clara, with capacities between 500 and 1,000 students. These schools are located next to the city level sports facilities. They have specialized laboratories and include in their program a sports clinic. The EIDE schools combine normal study from primary to senior high school, with manual work and sports, including the preparation for 10 different sports disciplines. Their capacities range from 1,000 to 2,000 boarding students. In 1979, eight schools of this type had been completed or were under construction in different cities. 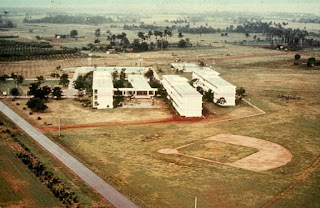 Polytechnics constituted the largest share in secondary education and were located next to facilities dedicated to industry, forestry, mining, cattle raising, agricultural, health, etc. The components of these Schools are usually standard buildings for the educational and dormitories buildings, being only different for the facilities dedicated to the specialization. 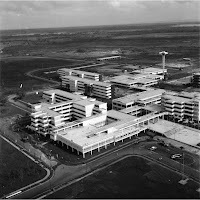 Among the many technological schools that have been built we can mention the Electronics, the Naval Shipyard's and the one for Dairy Facilities in Havana, the Forestry and Sanitary in Pinar del Río, the Mechanical and Refrigeration in Santa Clara, the Construction in Cienfuegos, the Livestock in Camagüey, the Agricultural in Matanzas, the Sugar Industry attached to the different sugar mills, etc. In the 1976-80 five years period the demand for secondary and intermediate education will double the 1975 figures. The new demand is being met with more austere non-boarding urban schools. Urban Junior High Schools, are located at the level of housing microdistricts, with 3 and 4 stories standard projects for 600 and 1,200 students respectively. Only consist of the essential educational facilities such as classrooms, workshops, laboratories and sports fields. The built area of the urban high school is such that its use with a double class session is 5 times more intense than that in the Countryside Secondary School. For the 1977-78 academic year 60 units of the type described were operating. Urban Polytechnic Schools devoted to training skilled workers have been designed using this same criteria in order to multiply the effectiveness of the resources devoted to building schools. The planned capacity for these schools is 1,000 students in two shifts. The built area is 2,743 m2 with 2.7 m2/student, resulting in an index which is 4-5 times lower than that of the previous projects that included boarding facilities. The solution in plan is compact and takes place around an elongated central courtyard covered with skylights. Among the specialties studied in these schools are those of mechanics, welding, electricity, carpentry and construction. Along with the schools, we must also group those facilities required for the extracurricular activities of the "José Martí" Union of Pioneers, which include provincial, national or international Pioneer Palaces and Camps. Another complementary school system installation is the day care center (Círculo Infantil), which caters to preschoolers whose mothers work. The Day Care Center receives children aged between 45 days and 5 years old. Currently one story centers for capacities of 120 to 180 children and with two stories for 180 children are being built. On an experimental basis some 3 stories centers for 180 children have been built in Havana's most congested areas. As foreseen in 1979, the main effort in the field of school buildings would be directed over the next decade towards higher education. In 1959 there were in the country less than 3 students per 1,000 inhabitants at that level. This index had increased by 5 times until 1978, counting that year 14.5 higher education students per 1,000 inhabitants. Higher education was also enriched in terms of specialization. The number of careers studied in the country had increased from 24 to 40 in the last 20 years. This specialization determined the emergence of a varied typology among higher level centers. In 1979 new universities, polytechnic, agricultural sciences, medical sciences, mining and metallurgical, teaching and economy colleges were being designed and built, distributed among almost all provinces. Despite the limitations imposed by its being conceived as a solution to a specific school program its widespread use, the size of the installed capacities and the rapid mastery of the technology by the construction brigades, made the "Giron" system to be seen as an answer to the demand for building capacities in other fields far different from education. Construction activity related to social projects experienced during the seventies a growth worthy of mention: from a production of 25.4 million pesos in 1970, it had reached 116 million in 1978, representing an increase of 358%. The constructional response related to some social programs like sanitary, sports, tourism and recreation buildings has been influenced by the rapid development of school buildings that have undoubtedly contributed the most characteristic element in this stage of Cuban architectural practice. 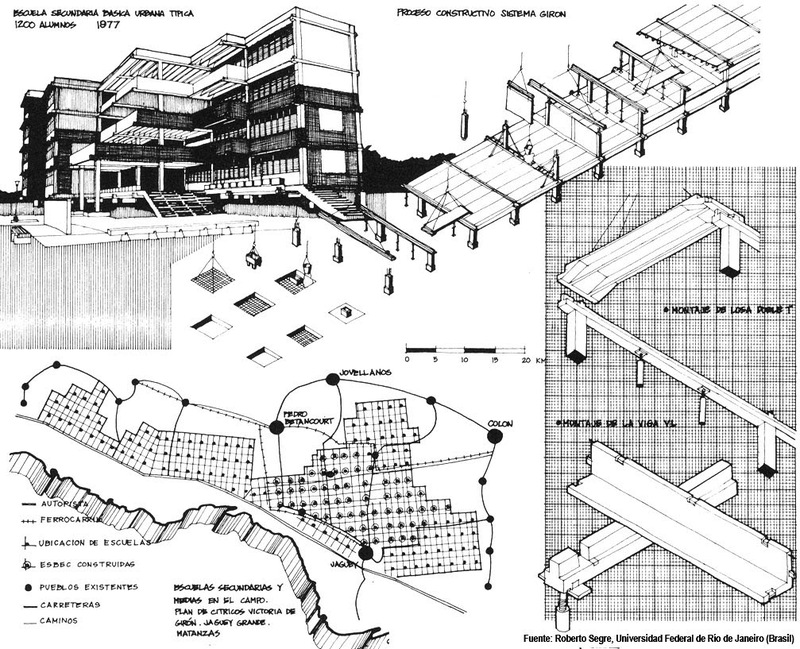 Subpáginas (1): Giron Prefab Building System.